The second installment in the adventures of Katniss Everdeen based on the Suzanne Collins novels, The Hunger Games: Catching Fire provides depth to the story but limited forward progression. The movie suffers from middle-child syndrome, lacking a proper opening and leaving the ending for another day. 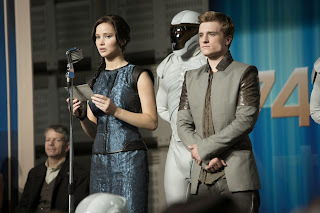 But the film does fulfill its objective of transforming Katniss from naive competitor to potential revolutionary leader. After surviving the 74th Hunger Games along with fellow District 12 competitor Peeta (Josh Hutcherson), Katniss (Jennifer Lawrence) tries to overcome the trauma of the Games by seeking comfort with boyfriend Gale (Liam Hemsworth). However, Katniss and Peeta's act of rebellion in both surviving the Games begins to inspire an uprising in various Districts. President Coriolanus Snow (Donald Sutherland) insists that Katniss and Peeta pretend to be true lovers and loyal to the Capitol, as they travel through Panem on a victory tour with chaperon Effie Trinket (Elizabeth Banks) and previous District 12 winner Haymitch (Woody Harrelson). But with an insurgency spreading, Snow conspires with new game-master Plutarch Heavensbee (Philip Seymour Hoffman) to throw Katniss and Peeta back into the arena by re-casting the 75th Hunger Games as a battle among previous winners. Facing another duel to the death among 24 competitors to be broadcast live by gleeful presenter Caesar Flickerman (Stanley Tucci), Katniss and Peeta forge an alliance with electronics expert Beetee (Jeffrey Wright), the athletic Finnick (Sam Claflin) and the resourceful Johanna (Jena Malone). But these Games will be different, with vicious fights for survival against elements unleashed within the arena, and an unexpected outcome. Catching Fire is one long bridge from the original premise of the first movie to the climactic battles to come. There is a sense of biding time, as the first half is preoccupied with the Victory Tour, and Katniss beginning to sense that something has changed in Panem. Her small act of defiance has triggered a new, flickering hope throughout the land. With the regime clamping down with heavy handed brutality, Katniss slowly realizes that whether she wants to or not, she is becoming a symbol of rebellion and the public face for a movement that she does not yet understand. The second half of the movie is an unfortunate retread of the original, Katniss and Peeta thrust back into the arena for another battle to the death. The 75th Games are more of a strategic struggle against the elements, not too different from a rather tiresome episode of television's Survivor. In succession, a poisonous mist, killer baboons and Alfred Hitchcock's The Birds create a litany of "what next" challenges thrown at the competitors, triggering several rounds of frantic running around and arm waving. As much at Katniss tries to remain the protagonist, there is no escaping the reality that in these Games events happen around Katniss, and members of her alliance are busier than she is fending off the threats. Katniss and Peeta evolve into treasures to be protected rather than problem solvers, and with the central role elevated to a symbol rather than a heroine, Catching Fire begins to flounder. Outside the arena, Director Francis Lawrence does create a grim environment throughout Panem, colouring the film with depressed greys and relatively pale greens as the winds of violent change start to travel through the land. He also extracts good performances from the cast, Jennifer Lawrence again providing the magnetic centre of the film in an intense, introspective performance full of growth from warrior girl to rebel leader. However, Lawrence does suffer from a Katniss who has to endure a uniformly grim disposition in this episode: she has no opportunity to be anything other than upset or angry. In support Woody Harrelson makes the biggest impact, as he often does, here giving Haymitch a knowing glint in the eye, offering Katniss the strongest clues that things are different, while still enjoying large quantities of booze at every opportunity. Donald Sutherland delivers a standard evil hissing dictator performance, but Philip Seymour Hoffman looks a bit lost, his attempt at conveying Plutarch's mysterious agenda coming across as rather disinterested. Tucci is as over the top as can be expected from an intentionally aggravating television show host. The actors representing the three boys in Katniss' life hover around Lawrence like dark planets orbiting the sun. Josh Hutcherson, Liam Hemsworth and Sam Claflin are all steady, with Claflin the most animated and least dewy eyed, but all three are quite overshadowed by the girl in the middle of their lives. The revolution in Panem may be catching fire, but the career of Jennifer Lawrence is burning hotter than the flames in the streets of the Districts.